Heather graduated from Wayne County Community College in 2011 with an Associate of Applied Science Degree in Veterinary Technology. She became a Licensed Veterinary Technician the following year. "From the time I was in elementary school I had decided I wanted to become a veterinarian. In high school I had an opportunity to go to a summer camp for people interested in the veterinary field. While there, I learned about the position of a veterinary technician - and I knew that was what I wanted to do. 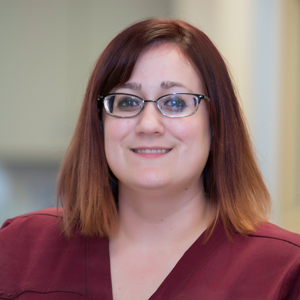 I would be able to be more hands on with patients and not have to make the hard decisions of diagnosing or perform surgery (the idea of performing surgery makes me squimish, but I don't mind assisting at all!)." Heather began her veterinary trek working with exotic pets at a PetSmart and also working as a veterinary assistant while still in school. After she graduated, she stayed in general practice for another 4-5 years and then wanted a change... She decided to try emergency medicine - and fell in love! "Emergency medicine has become a passion of mine that I never thought would be possible - I don't think I could ever go back. I love seeing the dramatic improvements in our patients. They may come in very lethargic and may not be doing well, but with a little TLC and great patient care, they leave wagging their tails like a completely different patient. I also love seeing all the exotics! I have always had a love for reptiles and pocket pets! Heather enjoys sharing her personal experiences and knowledge with pet owners. She has her own "mini zoo" at home already, but would like to further her career with a specialty certification in exotic care and/or a focus on zoology study - maybe one day she will get to work in the reptile house at the zoo! When Heather isn't busy caring for AEC patients she is spending time with her husband and all her critters. She owns 3 dogs, 2 cats, 3 chinchillas, a ferret, a corn snake, and a bearded dragon. She also has a Quaker parrot and a chameleon that reside with her mom!